The oldest well-known script in Sweden was typed with runes. The script was founded in the first century AD and it was in common use in more than 1000 years. On runic staffs and in certain local scripts in 'Gotland' and 'Dalarna', it was in use all the time until the 19:th century. This is a presentation of a number of inscriptions, the geographical location and how they will be interpreted. 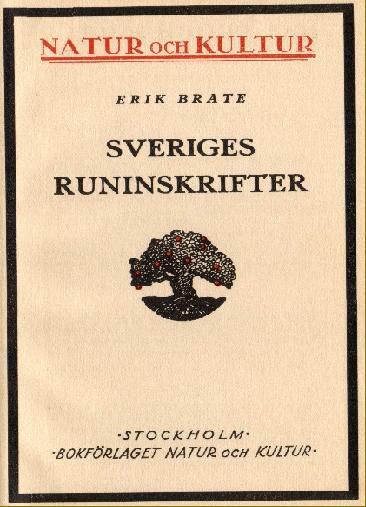 The book 'Runic inscriptions in Sweden' was written in 1922 by the linguist and professor at Uppsala university Erik Brate (1857-1924). This English text has been mechanically translated from the original Swedish text and it is searchable in this website.